On Saturday the 18th July 2015 Shirley Gibson will give a talk on 'Dolls and Doll Making from 1700 to the Present' at The Quilt Study Group of NSW meeting. Shirley has been a member of The Quilters’ Guild of NSW since its inception more than 30 years ago. She taught dress making and millinery for many years at technical college. She has always loved sewing but is also an accomplished landscape painter, as well as being a patchwork and quilting teacher and a member of the Guild's quilt evaluation team. 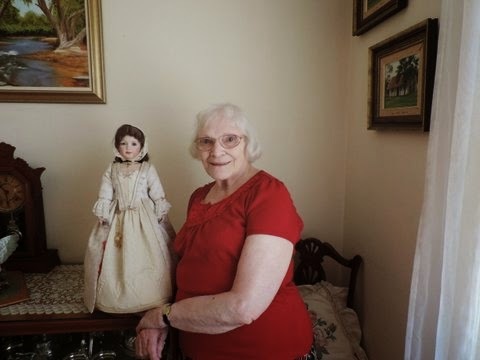 Shirley will show us all the components she uses in making her reproduction porcelain dolls - greenware, handmade wigs, shoes, and even knitted socks and crocheted gloves. The dolls are made entirely by Shirley herself. Some have up to five petticoats underneath and a hoop. Her dolls are mainly from the Edwardian, Victorian, and Georgian periods, and she has even made an Amish doll and her quilt. All the details have to be scaled down to fit the doll; for example smocking has to be smaller, the quilting finer and the wool split to make it a smaller ply for knitting. Her dolls are exquisite and have so much attention to detail. Come and join us at The Glover Cottages 124 Kent Street Sydney at 2pm for this most informative talk and display. Bring along your own dolls to show, and stay for afternoon tea afterwards. Guild members pay $5 and visitors $10.